The Royals first round pick, second overall in 2007, Mike Moustakas will make his Royals debut Friday at the third base, against the Los Angeles Angels of Anaheim. The Royals optioned infielder Mike Aviles to Triple A Omaha. Royals fans have been waiting to see Moustakas put on the Royal blue. 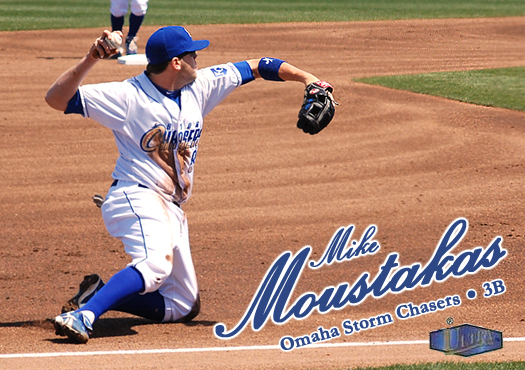 Moustakas is batting .287 in 55 games for the Omaha Storm Chasers with 10 home runs, 15 doubles and 44 RBIs. If he can play as good as first baseman Eric Hosmer, Royals and fans will be happy. Royals are needing a lift on offense and will certainly bring us a good bat to the lineup. The future of the Royals looks promising as long as these young players continue to blossom. Moustakas will be the ninth rookie on the Royals roster.